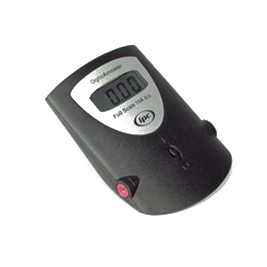 A digital millammeter able to measure to 199.9mA d.c. with a resolution of 0.1mA (IPC-1001-M). The 3½ digit liquid crystal display has 13mm high digits with a wide field of view unobscured by trailing leads. The display also provides indication of polarity and low battery. The unit is exceptionally easy to read. Two colour coded 4mm sockets are located on the sides for maximum convenience and anti-slip feet are fitted to the base. The meter is prorected from current overload by an automatically resettable fuse. Low operating current gives expected battery life in excess of 500 hours. Housed in a robust ABS case. Supplied with battery.